Bound and determined to go (with some kicking and screaming) into the 21st century. Studying social media marketing an hour a day. Quite mind blowing what’s happening and the rate of change thereof. WordPress now has a new poll function that I want to test, so here it is. Three months ago a deliberately started fire in an apartment on Basin Road jumped to the neighboring pink house, a local landmark, and completely gutted it. The response of the Juneau community to help the pink house family is remarkable. Read about it on the Pink House blog, and please send them some cash – every little bit helps. One of our grandkid’s friends, 9-yr old Ezra a neighbor of the pink house, raised $2,500 through his lemonade stand. Yesterday, the house was torn down, and with assistance and donations the family hopes to be able to rebuild. pre-order their book Journey on the Wild Coast: Four thousand miles along the edge of the Pacific, by foot, packraft, and skis. They’re devoted to communicating about the environmental issues facing this region. If you haven’t made plans to visit, get going….. Doing a bit of horn tooting in this post. Just finished my first e-Book – A Cruising Handbook – which essentially codifies the Cruising section of our Trouser Rollers website. It’s a free PDF download. I haven’t added all the links it needs yet, but that’ll happen over the next few weeks – didn’t deem that important enough to delay the release. It’s a complete beginners “How To.” If you dream of doing it, this could help. I was prodded to produce this eBook by several website viewers who commented or sent us email. This eBook covers pretty much everything we learned from A to Z while cruising on Callipygia. Believe me, it was a lot. 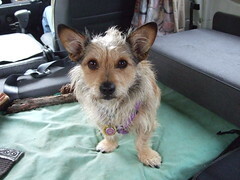 I’ve been spending time getting to know Sara, Sandy and Rae’s 6-yr old Australian Terrier. Quite the most intelligent kid on the block, with a vocabulary of at least 20 words. Extraordinarily sweet natured and well behaved (with occasional rare outbursts of stubborness), loves to run after and fetch a tennis ball, goes swimming, and snuggles upside you for a quality-time tummy rub after a good hike. Also, I’ve uploaded a bunch of photos taken since I arrived in Australia to my Flickr photo journal. I promise to weed from it some of the too-many photos of a Silver Gull – I’ve logged about 30 different bird species here. These include 23 lifers – although some of them I saw and photographed on our last visit in 2002, but I wasn’t a birder then so they didn’t count. The trip to “down under” was uneventful – we arrived in Seattle on Tuesday morning and ascertained that all flights to Juneau before Bill’s scheduled one in the evening were overbooked. Perhaps a fall-out of the continuing Mt. Redoubt eruptions which are keeping Anchorage airport on tenter hooks due to ash. I had previously booked an airport hotel so Bill came with me to eat lunch and hang out (ie take a nap) until it was time for his flight. When awake, we entertained ourselves watching news coverage of the G20 meeting in London. Amazed at how the Obamas towered over the Queen and Prince Philip – I once thought he (Philip that is) was tall. Wednesday, I veg’d out in my hotel room until time to go to the airport early afternoon. Three legs on this flight (changes in San Francisco and Sydney, then Melbourne.) The long one (14 hours) across the Pacific was often bumpy but otherwise uneventful – broken up by short catnaps, a movie, some reading, and 3 servings of uniformly ghastly food. A thunderstorm broke over Melbourne soon after arrival as I found my way to the Skybus which took me to Southern Cross Railway Station and my vLine train to Lara. Sandy and Rae met me in Lara and brought me to my home-away-from-home for the next 6 weeks. While missing Bill and Juneau, I’m glad I’m here to for support as Sandy begins radiation treatment. I’m suffering a bit of culture shock, but no doubt that will pass after a while. The weather is colder and wetter (I got soaked twice yesterday) than I anticipated, the birds are phenomenal, and little Sara (Australian terrier) is a sweetheart. Meanwhile, on the home front, I catch up with Bill on a daily Skype conversation and find out wots ‘appenin in Alaska via email and on the Internet.